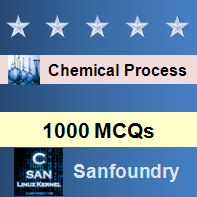 This set of Chemical Process Calculation Multiple Choice Questions & Answers (MCQs) focuses on “Material Balances -IV”. 1. What is the mass fraction for H2O in feed and NaOH in product? 2. What is the mass in kg of H2O in feed and NaOH in product? Explanation: ΣωI = 1 and mi= ωIW. 3. What is the mass fraction of NaOH in A? Explanation: ΣωI = 1 and ΣωIWi = 0 for each component. 4. What is the mass fraction of H2O in A? 5-7. Tank A contains 90% O2 that is mixed with another tank B containing 30% of O2 to get a Tank C containing 65% O2 . 5. What is the ratio of the gas used from Tank A to that used from Tank B? 6. If A = 100 moles, what are the number of moles of B? 7. If A = 100 moles, what are the number of moles of C? Explanation: The number of variables whose values are unknown minus the number of independent equation is degree of freedom. 9. Concept of material balance based upon? Explanation: Material balance is based on conservation of mass. 10. Closed systems have ________ type of boundary wall. Explanation: The matter is not allowed to cross the boundary wall of a closed system.